GEMS International School has announced a series of innovative initiatives under the MYHealth programme, following the recent developments in health strategies and policies in the UAE. GEMS International School responded quickly to the National School Health Agenda’s new requirements, with the launch of ‘MYHealth Kids’, a school initiative and programme to support all students, said a statement from the organisation. 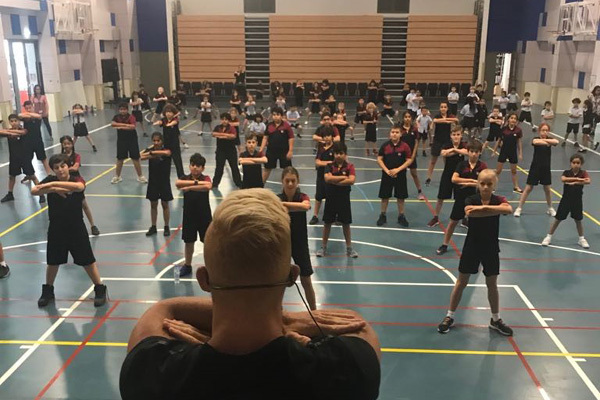 The programme includes a personalised fitness plan where students are set targets to maintain or improve their fitness components, based on students’ individual performances in standardised fitness tests and an encouragement to join numerous activities throughout the year, it said. The launch of MYHealth was hosted by two Middle Year Programme students, who along with Graziano Mannari (ex-professional at AC Milan) and Nicola Ventola (ex-professional at Inter Milan) encouraged students to be physically active and set goals for themselves in areas they need improvement, it added. The launch event was attended by educational leaders from GEMS Education including Glen Radojkovich, GEMS International School chief executive officer and head of School; and James MacDonald GEMS Education, vice president for the IB and American cluster. The launch brought students, parents and staff together to participate in physical activities, healthy food preparation and relaxing activities and was a huge success. “As a school that values student wellbeing, we are extremely pleased to know that the government is requiring an increase in active time for learners,” he said. Since the launch of programme, the school has also announced the launch of ‘MYHealth Staff’ and had many external providers contributing with a different range of activities from collection of biometric data, food awareness, yoga and physical exercises, said a statement. Companies like Fitness First, Rig Crossfit, Golf DXB, Art of Living Dubai, Nicky Fitness School, AC Milan, Hamilton Aquatics, Shaolin Kung Fu, Ultimate Athletics, PH7, and Dubai Creek Golf and Yacht Club have been supporting GEMS International School to deliver its programme, it said. Over 58 staff members participated in the physical activities, before and after school. Staff families also came together to participate in the Super Sports Run while trying to set goals for themselves, it added. Additionally, ‘MYHealth Parents’ will follow up on these initiatives, as it will be launched during the next academic school year, it said.